Colour measurement is required in many industry sectors, enabling companies to select, monitor, differentiate, grade and sort various types of coloured objects involved in manufacturing, automated handling and other production processes. Measured objects can take the form of solids, powders or liquids and it is also possible to measure the colours of transparent or translucent surfaces such as coatings, labels and plastics, as well as LEDs and glass objects. In order to fully understand which colour measurement technology your sensor requires for a specific application, it is important to consider the following factors. When defining a colour of an object, the term ‘colour space’ is often used. In industrial non-contact colour measurement applications, there are three main types of colour space that colour sensor technology use: Greyscale colour space, the CIE RGB colour space and the CIE XYZ colour space. Although the sensor supplier’s datasheet may state that the sensor you are purchasing is a ‘true colour’ sensor, it is important to ask which colour space the sensor chip technology is based on, as this can have dramatic effects on sensor performance. This is defined as a colourimetric (or more specifically photometric) greyscale image that has a defined greyscale colour space. This maps the stored numeric sample values to the achromatic channel of a standard colour space, and is based on measured properties of human vision. These sensors are using greyscale references against RGB colour space to define the colour rather than ‘true colour measurement’. The CIE RGB colour space is an additive colour model in which red (R), green (G) and blue (B) light are combined in various ways to reproduce a broad array of colours. All three colours are displayed as one result in the colour white. Black colour is produced when R/G/B = 0/0/0. RGB is a device-dependent colour model, which means different devices detect or reproduce a given RGB value differently, as the colour elements and their response to the individual R, G and B levels vary from manufacturer to manufacturer, or even in the same device over time. Thus, an RGB value does not define the same colour across devices without some kind of colour management. Typical RGB input devices are colour TVs, video cameras, image scanners and digital cameras. Typical RGB output devices include computer and mobile phone displays, video projectors and multi-colour LED displays. The CIE XYZ colour space is based on perceived colour in human colour vision (very large green and small blue/red range). X and Y are colour vectors that describe hue (i.e. colour differentiation) and saturation (i.e. the relationship between colourfulness and brightness). Y is a value (brightness) scaled from 0 to 100. The CIE XYZ colour space encompasses all colour sensations that are visible to a person with average eyesight. That is why CIE XYZ is a device-invariant representation of colour. 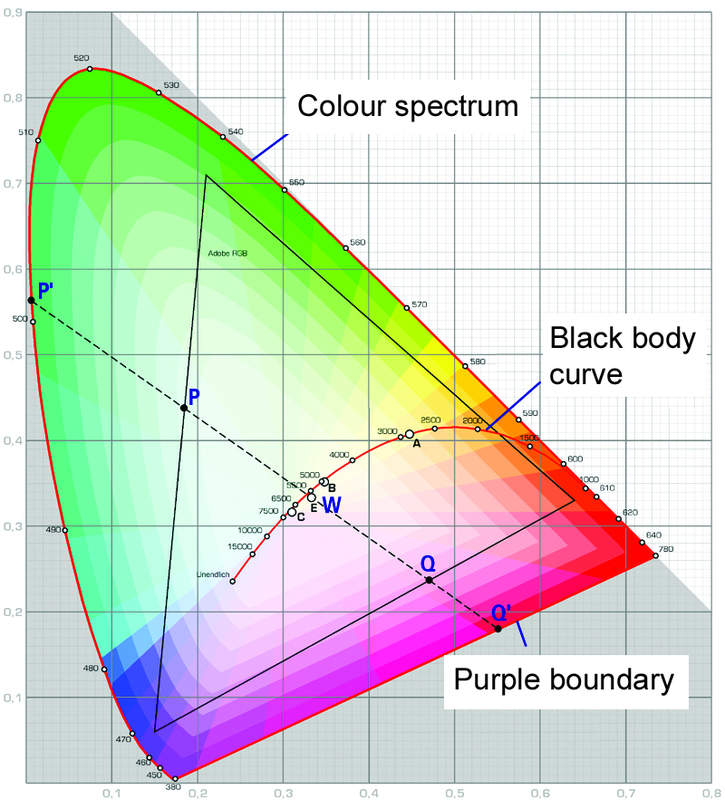 It serves as a standard reference against which many other colour spaces are defined. Colour sensors with chip technology based on the XYZ colour space are therefore more accurate and more sensitive to colour variations than sensors based on the RGB model. In addition, XYZ sensors can measure colour on different surfaces and textures. For example, they can detect slight colour changes on different grains of sandpaper – from smooth to coarse/rough as well as the background colour of the sandpaper. RGB colour sensors cannot do this. A colour sensor compares colours, or more accurately, checks if colour values match. The measurement object is illuminated using a light source (normally LED) and the reflected colour components are then evaluated. The colours of the inspected object can be taught to the sensor and stored in a colour memory. These taught colours can be assigned acceptable deviation tolerances. The stored colour values are compared with the determined values by calculating the colour difference, Delta E (ΔE) between object colour and the taught reference value. The colour difference ΔE is the result of the three coordinates in the XYZ colour space. If these values match (within the tolerances), a useable output signal is generated. One of the benefits is that the sensor evaluates the colours in the same way as the human eye, which is why an XYZ sensor is called a ‘perceptive’ or ‘true’ colour sensor. How accurate does your sensor need to be? Is it the absolute colour that you need to measure or just colour detection? For measuring absolute colour, the sensor accuracy will need to be high, in the range 0 to 1.0 ΔE. In the plastics industry, colour measurement sensors have a wide variety of uses. When plastic parts that are supplied from different manufacturers and made from different materials are combined, it is essential that the colour values of these parts are exact. If they are not, quality assurance can become an issue. In injection moulding, for example, non-contact colour sensors with XYZ chip technology can inspect the colour of injection-moulded parts as they are extracted from the mould, without having to wait for the parts to cool down. This dramatically reduces cycle times and allows for 100% quality control of colour. An XYZ colour sensor is able to detect the slightest of colour variations in the mould as it cools down – an RGB sensor can only see red. An XYZ sensor will see shades of colours as the mould cools, helping operators detect if something is wrong with the machine or if pressures in the mould are inconsistent. Colour changes may also indicate that the dye has not been mixed correctly. XYZ colour sensors can also inspect interior plastic parts in vehicles. Any slight deviation in a grey coloured interior dashboard can be reliably detected. This is particularly important if the vehicle’s interior parts are supplied by a variety of different manufacturers, where colour variations can often occur. Even plastic transparent or translucent parts can be measured using an XYZ colour sensor. Car attachments such as parking sensors are painted separately. However, during assembly there must be no difference in colour between the parking sensor and the bumper, which means the two colours must be identical. XYZ colour sensors enable a direct colour comparison between the parking sensor and the bumper.